Hi guys! I thought I’d create a behind-the-scenes post to give you some insights on the ideas and reasons behind the “In Ruins” comic. 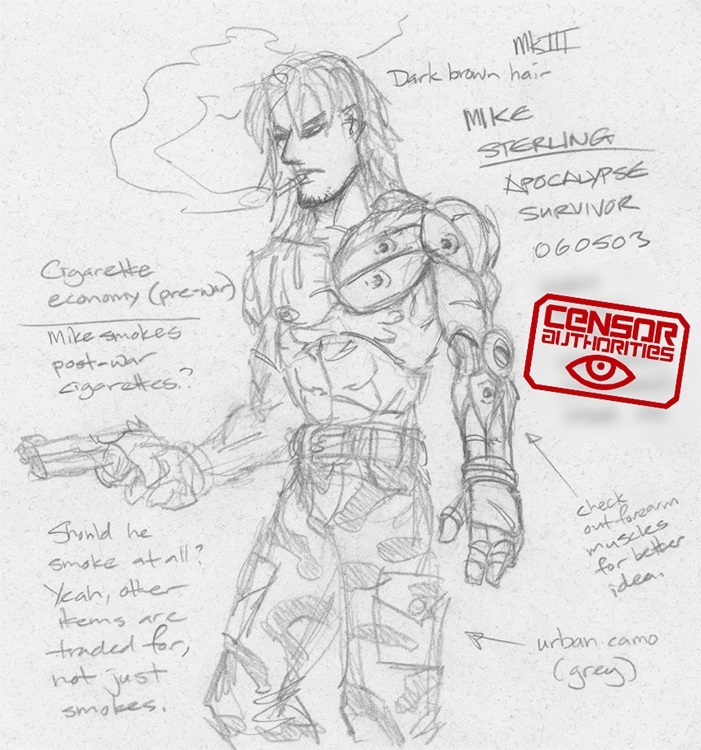 This post will focus on one of the main characters of “In Ruins” – Jake McKenzie. Jake was based on an “Aftermath” RPG character of mine, back in the late ’80s. I have a picture of him from back then (he was originally called Mike Sterling), that I will include in a later post because of costume spoilers. Rest assured, he also lost an arm and had it replaced with a robotic one in one of the adventures we had. So Jake was always going to have a mechanical arm, it’s not a recent thing. When I was working on the comic and the trailer for “Mad Max: Fury Road” came out, I was all “Dammit!” But Furiosa is her own character and so is Jake (plus her arm is much more basic than his, made of tools and parts). As you can see, his robotic arm was originally on his left side, but when I came to do “In Ruins” I preferred it being on his right. Once it’s revealed, it’s the first thing you notice about him. I’ve simplified his arm down from the 1980s version (influenced by Simon Bisley’s run on the “ABC Warriors”) because I wanted you to be able to look through his arm as well. Jake’s backstory was created especially for “In Ruins” and more of his history will be revealed later. Jake was always one of my favourite characters, so I’m glad that I finally got to create a post-apocalyptic comic for him and bring him to life a little bit more. So, there’s a little taste of some behind-the-scenes facts. Hope you enjoyed them! Let me know in the comments section if you’d like to see more of these kinds of posts. I’ll see you again on Friday for more “In Ruins”!